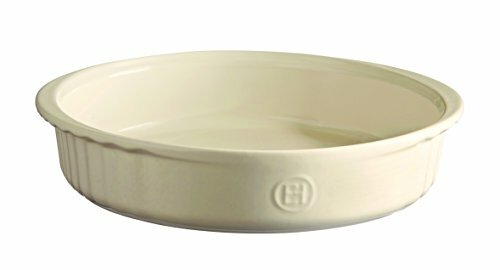 Our Emile Henry dishes bring a delicate, natural touch to the preparation, cooking and presentation of your lasagnas, gratins, roasts. Made from HR ceramic (high resistance), they diffuse the heat evenly, ideal for controlled, natural cooking, and can go directly from the freezer to the hot oven. Our strong glaze protects your dish from scratches and chips, and it can be cleaned in the dishwasher without losing its Color. All Emile Henry products are made in France and offer a ten year guarantee. This deep dish is wonderful for crust lovers. It's stunning and doubles as a baker for Macaroni and cheese or other family favorite. Inspired by vintage French bakeware, this dish absorbs, distributes and retains heat evenly, so Pies bake and brown to perfection. Clay is a soft, smooth cream color.